gray. Mama carried a big basket of oranges on her head. Sasifi carried a smaller one. “Will we ride in the tap-tap today?” Sasifi asked. Sasifi has just turned eight and is very proud that she is now big enough to help Mama on market day. 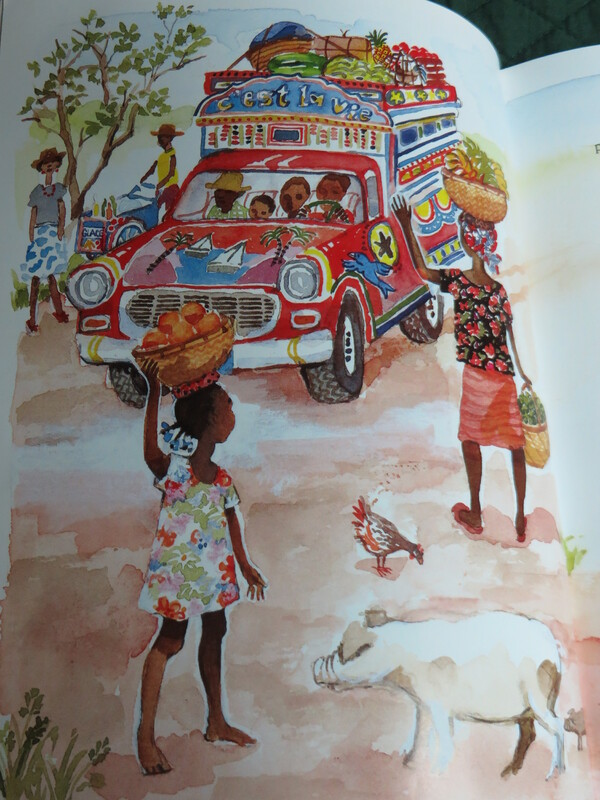 But she would love to try traveling in a tap-tap (a brightly painted share taxi) instead of walking. This engaging book deftly portrays a way of life very different than our own (the boys wondered why Sasifi’s family did not just buy a car, which lead to an interesting discussion) and is gently humorous. My youngest especially enjoys it. This entry was posted in Picture Books and tagged Animals, Catherine Stock, Diverse Books, food, Haiti, Karen Lynn Williams, Machines, Tap-Tap. Bookmark the permalink.